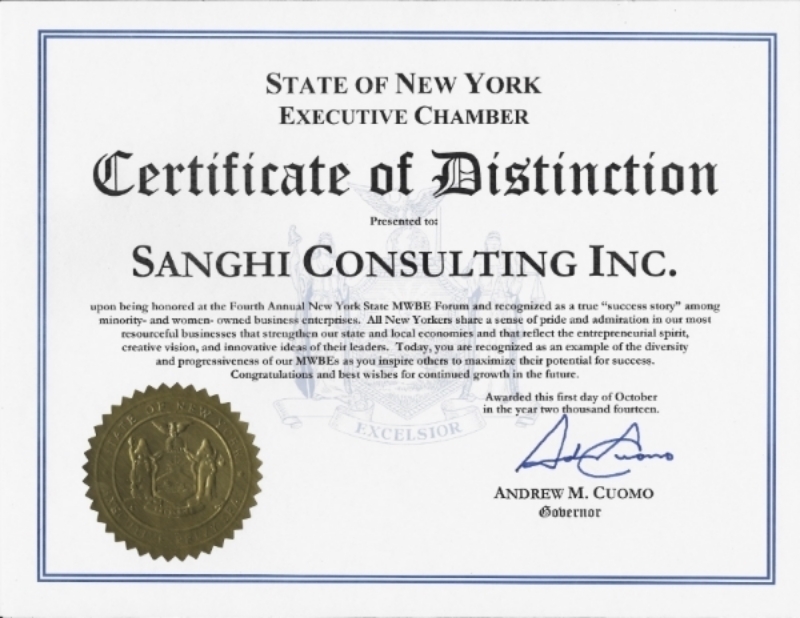 Sanghi Consulting, Inc. is a New York State-certified Minority-Owned Business Enterprise. We are committed to subcontracting with other certified Minority, Women, Small, and Service-Disabled Veteran-Owned Businesses (M/W/S/SDVBEs) in order to meet Governor Cuomo's 30 percent utilization goals. If you are interested in subcontracting opportunities under PBITS, visit our Affiliates page. If you are interested in learning more about MWBE certification and other contract opportunities, contact us. We are focused exclusively on delivering public value in New York City and across New York State. SCI has been recognized by the Governor's Office as a true success story for our progressiveness, diversity, and entrepreneurialism.